How many times have you heard that breakfast is the most important meal of the day? I’ve heard this statement countless times, and I know it to be true; but I still found myself skipping breakfast. Not any more. I make sure to eat a healthy breakfast every morning. Starting the day with a healthy meal helps curb my cravings for non nutritious food throughout the day. My sister is a super fan of NBC’s The Biggest Loser. She recently purchased The Biggest Loser Cookbook. Check out Amazon, they have tons of Biggest Loser goods. My sister sent me a recipe for better for you blueberry cakes. I omitted the blueberries because I did not have any on hand, the pancakes were still delicious and very filling. I made my pancakes into two 1/4 c cakes instead of four 1/8 c cakes. 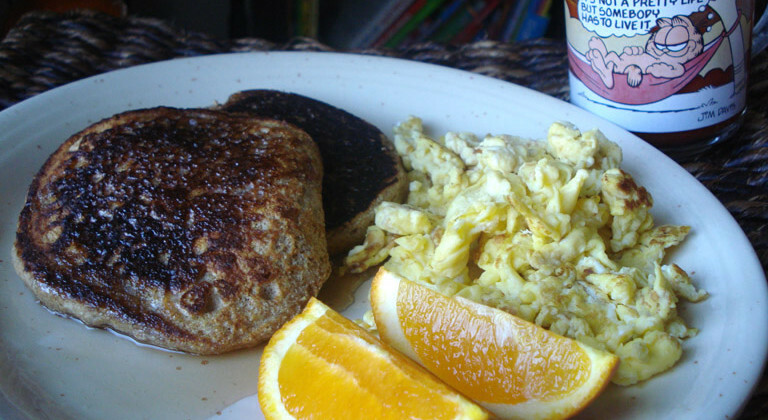 Two scrambled eggs, half an orange and a glass of V8 juice made a delicious breakfast with less than 350 calories. In a small bowl combine the buttermilk, flour, egg white, baking soda, vanilla and salt. Whisk just until blended. Stir in the blueberries. Let stand for 10 minutes. Heat a large nonstick skillet over medium heat until it is hot enough for a spritz of water to sizzle on it. Briefly remove the pan from the heat to mist lightly with I Can't Believe It's Not Butter! spray. Return the pan to the heat. Pour the batter in 1/8 cup dollops onto the skillet to form 4 pancakes. Cook for about 2 minutes, or until bubbles appear on the tops and the bottoms are golden brown. Flip. Cook for about 2 minutes, or until browned on the bottom. Repeat with the remaining batter to make 8 pancakes total.